As an attendee of the Stampin' Up! Minneapolis Regional Seminar, I can offer you $50 off the Stampin' Up! Starter kit. Wowza! 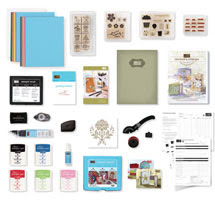 For only $149 (regularly $199), you can get started with your Stampin' Up! business. You won't believe all the product that is included in the Demonstrator Starter Kit, especially at this price. Also, you get to customize your kit with the stamp sets and colors that you choose! Plus, if you sign up with me during this special, I'll add my own gift to you - your choice of a stamp set or tool from our catalog, priced at $30 or less! The Stampin' Up! quarter is just beginning, so you will have until September 30th to meet your quarterly minimums AND you'll have a chance to earn many additional FREE stamp sets from Stampin' Up! as you meet Stampin' Start goals and/or Consistency Counts goals! Contact me for the paperwork to get started on your business today!